Add the treacle, sultanas and tomatoes. Transfer to the preheated oven for 1 hour or until cooked. Check halfway through cooking, you may need to add a little more water. 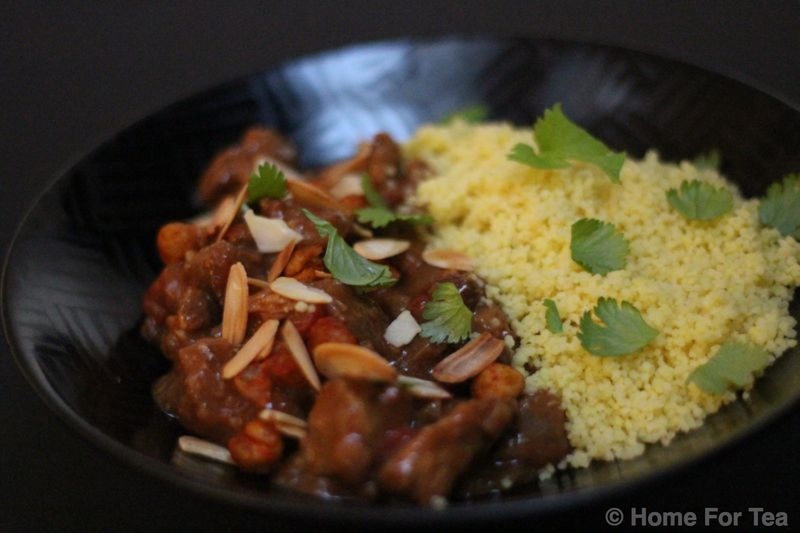 Serve with some toasted flaked almonds, coriander and couscous or boiled rice. * If you have a Slow Cooker with a removable internal pot (sear & stew) you can brown the meat and sauté the onion in the pot and follow the same instructions above. Sounds delish Niav…what would you suggest for a treacle substitute? Would honey work? I think the best substitutes Janette would be either dark brown muscovado sugar which has the same molasses type flavour and dark colour as treacle or else honey. I would recommend using slightly less of both than the dessertspoon (of treacle) though as both of them are sweeter than treacle – you can always add more sugar or honey at the end if you feel it needs it but you don’t want it overly sweet either.